Expand the standard PCI slot from mini pcie interface to meet the desire of notebook users to use PCI cards for security industrial users. 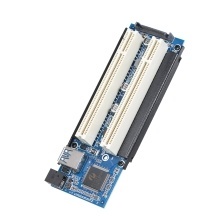 This PCI slot expansion card kit can also be used on desktop computers. The condition is that the desktop board must have a mini pcie interface; two full-length PCI cards can be used. Compliant with PCI Express 1.0a specification, PCI 2.3 compliant, for full-height Mini PCIe slots. Plug and play. No driver is needed. Support full height Mini PCIe slot. Support Windows 8, Windows 7, Windows Vista, Windows XP, Windows Server 2003(32bit)/2008/2000 and for Mac OS.